Non-cubical designs have shapes that are not cubes. They are characterized by two parameters: shape of a design and the design itself. The easiest shape is a rectangular solid. It differs from a cube only in that it has six rectangles as sides, not six squares. In my collection of non-cubical designs I present only one rectangular-solid design, so as not to bore my readers too much. By default, a shape of a cubical design is a cube. The other parameter is an overall design this shape has. You should not forget that the material for 3-dimensional designs is a set of Rubik's cubes. One can hardly construct a sphere from such a set. Certain elements of a cube or rectangular solid remain untouched. Examining the structures in this page can see this. I just walk around with my eyes open. If I see something that looks promising, I do some hard thinking and twiddling. I must not neglect the other parameter, the overall design. Above all, I should determine, which cubes form parity pairs and why. The symmetry criterion is strictly adhered to, regardless of shape. This criterion does not make non-cubical designs easy, on the contrary. Parity pairs are absolutely essential. If you did not familiarize yourself with parity pairs please try to do so before delving deeper into non-cubical design construction. A parity pair is a set of two cubes of identical color scheme, but the colors on two opposite faces of one cube are switched relative to the same colored faces of the other cube. Individually those cubes look the same. But as a pair they are very important in the theory of three-dimensional designs. 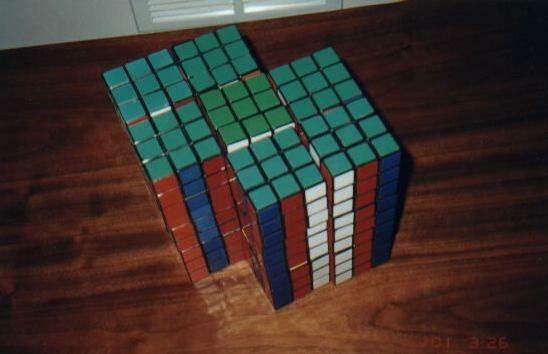 Such cubes can be arranged, so that the faces that touch are colored the same. This two-cube structure has only five colors on its combined six faces. The color of the touching faces is hidden. From two such two-cube structures one can create a four-cube structure, that hides two colors and shows only four. And finally, from two four-cube structures one can construct a 2x2x2 cube that hides three colors and shows only three colors to the world. After all, no cube has more than six colors or six faces. Notice that I do not talk about Rubik's cubes just cubes. I wonder if someone thought of building a set of paired cubical blocks and teaching preschool children some elementary geometry? We might be surprised at how well the kiddies would grasp these concepts. Did I discover parity pairs? That's what I would like to know. When I, without success, tried to find people who create three-dimensional designs, this question came up. David Singmaster, an English professor of mathematics and a recognized expert on the Rubik's cube, emailed me about another English mathematics professor, John Conway, who is said to come up with the idea of "parity pairs" in the 80s. Singmaster did not say, if Conway applied this idea in three-dimensional design theory. I tried to contact Conway via email, but he does not answer. Perhaps he thinks that some weirdo is trying to rob him of his valuable time. So I am back to square one. There is no indication on the web that Conway worked out any designs. But that seems to indicate... enough of these speculations. Constructing designs on Rubik's cubes naturally requires Rubik's cubes with the appropriate mathematics. This topic belongs more in the field of recreational mathematics, than children's games. 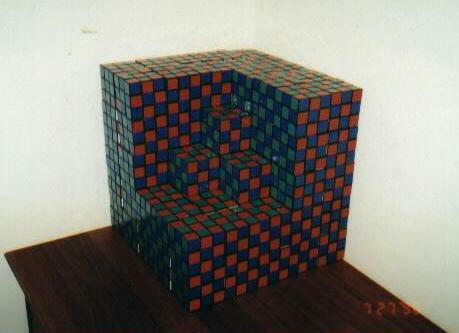 Even grown-ups sometimes experience problems with Rubik's cube. A warning is sounded: If you cannot solve the Rubik's cube completely, try to master the solution, before attempting to create any three-dimensional designs! Non-cubical designs are probably the most involved. I don't really know, how many parity pairs each non-cubical design uses, that depends on need and primarily on the design's shape. It is best to have as many paired Rubik's cubes on hand as you can. Recall that with cubical designs it was sufficient to place parity pairs in the corners, and, with a few exceptions, that was enough. With non-cubical designs one cannot do that. Since I detest rote, I don't have number of parity pairs for specific designs committed to memory. As usual, I construct all designs, both cubical and non-cubical, "by feel." Constructing those designs is a "do-it" matter: either you can do it or you cannot. My first non-cubical design is a bit of a put-on. I use the fact that Krtetice design is a rectangular solid, rather than a cube. This rectangular solid has two identical squares and four identical rectangles. I also must pay attention to edge cubes along the Y-axis. This problem is very similar to the one of the edges along the Z-axis of the cubical design called ctyrsprezi. From the viewpoint of design construction those shapes are very similar and very, very simple. Don't worry, I have no intention of showing one rectangular solid after another. That would be too cheap. In fact, this is the only rectangular solid in my collection of non-cubical designs. But if you got carried away with non-cubical designs, and do not wish to bother with cubes, please try to start with Krtetice design anyway. You may need to learn how to handle parity pairs. If you don't need that skill, excellent, go right ahead and create real non-cubical designs. Start with next, the 102-cube Vasarely design. 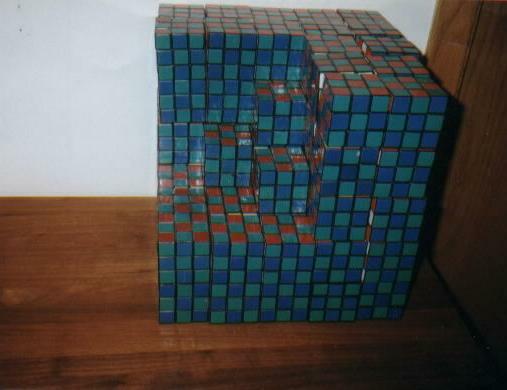 By the way, for Krtetice design one needs 36 Rubik's cubes. Vasarely is my oldest non-cubical design. At first glance it seems somewhat simple. Into a 5x5x5 cube we cut a 3x3x3 hole. Inside that enclosure we place four cubes, as shown in the picture. In order for the design to have three colors we need to include parity pairs in its corners. Problem is that Vasarely has 13, not 8 corners, including the 3 cubes in the enclosure; those are not paired. When I was done with Vasarely, and included it in the photo album of my designs, I did not expect the positive reaction I got from people. To commemorate Argonne's 50th birthday, an exhibit of photographs by about 90 people from Argonne, DOE and the University of Chicago was set up. Ten of those exhibited photos were selected and put on the Web. One may view the ten winning entries, read about the exhibit, including names of the three judges. Please, see the exhibit. The names of the authors are in alphabetical order. People seem to think that Vasarely is not just a boring cube, but has elements from modern architecture. Modern architecture is Greek to me, but I could try to construct some other non-cubical designs. So it was Vasarely that pushed me in this direction. Allow me to complain a bit. Vasarely shows three colors on all its sides. But this cannot be seen in the picture. What are the colors of the bottom, back and left sides? I know the answer to this question, because I really created the design. The easiest way to find out is to walk around the design. If the design stands on a glass-topped table, one can duck under the table to see the bottom surface. I have seen pages, where this can be done with a mouse. The design should be somehow animated, so it can be turned around from all sides. I tried to photograph Vasarely from a somewhat non-standard position and I was pleasantly surprised with the result. I enclose one such photograph, but I know of even better positions. If I could display this design somewhere, the visitors could take such pictures. The design really ought to stand on that glass-topped table, so that people could (if they wanted to) duck under the table to see the bottom surface. But how to make such viewing possible on the URLs?? I will very gladly set up a design, the only thing I am able to do. Can someone help me? Please contact me via email. Heartfelt thanks! I got the idea for this design from the Wunderland people. They claim that their own pyramid took a lot of work :-). I offered them a creation of my three-color pyramid, which would reflect my own taste. When I finished this design, I sent them email offering to send them its picture, if they would provide an address. They never responded. Well, now they can see the Bohemian pyramid on the web, if they want to. I daresay that, if we put the Bohemian pyramid and their own the Wunderland pyramid, side-by-side, my pyramid will not be put to shame. The Bohemian pyramid is actually three-color overall, but it could be more symmetric. It would look best, if the width of the step would be equal to its height. The lowest step is two layers high. Nothing can be done about this, if we really want the design to be three-color. Therefore the other steps should also be 2 layers high. The width of each step should be 2 cubes. The Bohemian pyramid has 4 steps; the last step should be 2 cubes wide and 2 layers high. The 4 steps must have these lengths: 2, 6, 10 and 14 cubes; then the total number of cubes ought to be 2x(14x14)+2x(10x10)+2x(6x6)+2x(2x2)=672 cubes. There are two serious problems and those are the reasons why I am unable to show the Bohemian pyramid in this form. Firstly, the area of a 14x14-cube square for placing the design is larger, than I have available. I do not want to put the design on the floor, because somebody might trip over it and get hurt. And secondly... 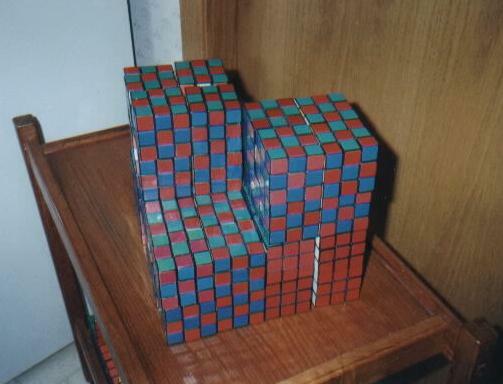 I just do not have that many cubes! One day I got an email from the Czech Republic from a father of an ill girl. He asked me if I could find out any news about a search of a cure for this illness. Oh my. I never heard about this illness. I don't understand such things. An access to the tons of information on the Internet does not qualify me as an expert in all sorts of sciences. I know physics and some math, but medicine is Chinese to me. That is what I have written to the girl's father. I suggested that he contact experts in the Czech Republic. They have same Internet information I have, and they would know how to apply it far better than I. All I can do is to create a design as name it after his daughter. After some time I created Lucie design - a so-called block design having three colors. From 8 cubes in 4 parity pairs one creates a 2x2x2 cube having three colors. You put together 4 such cubes into a 4x4x2 structure. The original 2x2x2 cube is called a block. You raise two diagonal blocks and put two clean blocks having three colors under each diagonal block. All Rubik's cubes used for building Lucie should be paired. A block for the design replaces each cube on the Lucia model. Lucie model has six cubes. 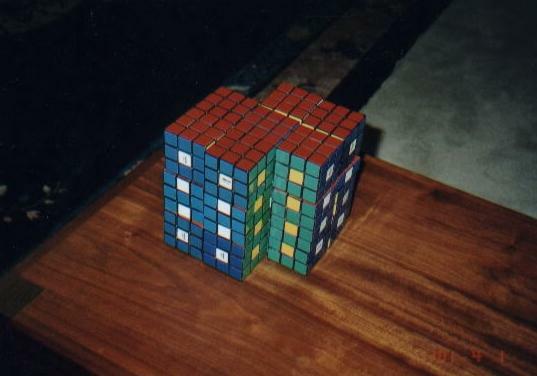 If Rubik's cubes are used, then there are two solved cubes and four unsolved cubes. Clean eight-cube blocks replace the solved cubes. Four checkerboard blocks replace the unsolved cubes. You can use such blocks in other designs of the same coloring. Try it and have fun. Vodnany design is named after a small south Bohemian town where I grew up. Unlike Lucie, it is not a block design. 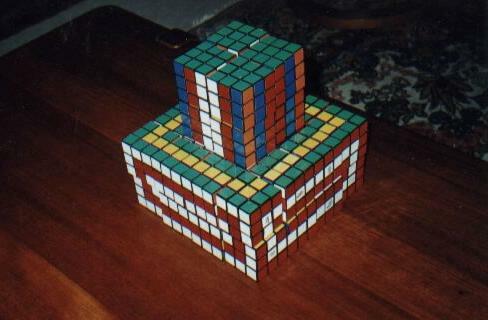 As can be seen in the picture, two columns of three cubes each are removed from a 3x3x3 cube. That quickly complicates inclusion of parity pairs, because you use them differently. Of course, the cubes in the upper and lower layer are paired, due to the appearance of the upper and lower layer. Nearest neighbors of the removed cubes in the upper and lower layer must form parity pairs with the corners, due to both the upper and lower layer, as well as the overall symmetry of the design. The cubes in the middle layer need not be paired, but you have to pay attention to the correct symmetry and overall match with the upper and lower cubes. 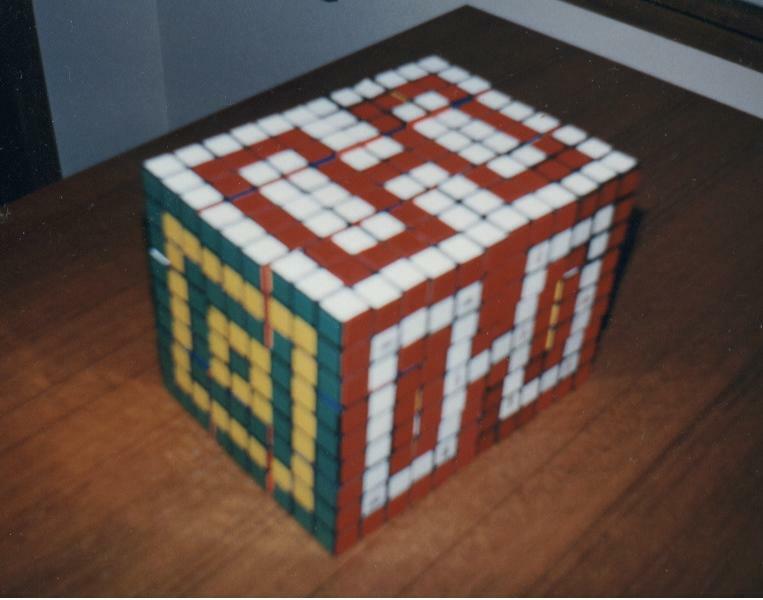 The patterns on individual cubes are not the easiest and require quite a bit of twiddling. When you make a mistake, you typically need to solve the cube and start all over again. Moreover you have to pay attention to the design's mirror symmetries. It is too much of "paying attention" for a relatively small, 21-cube design, but that us the way it is Those who attempt to create non-cubical designs, have some goodies to look forward to. The Design for Pedestrians is very similar to its cubical brother. Its shape is identical to that for Vodnany. The same shape but different pattern makes everything different. Parity pairs are the same as for Vodnany. Petrasek is a two-block design with unequal blocks. You met with two block designs, Lucie and Landry Staircase. All blocks in those designs are the same, but Petrasek has each block different in both color and geometry. The lower block is a 4x4x2 rectangular solid, whereas the upper block is a 2x2x2 cube. Both blocks must have parity pairs in their corners. As you can see, you can twiddle blocks of varying sizes, and put them together. Maybe it wouldn't be a bad idea to put the twiddled block cubes in a specially designed plastic box. One eight-cube block should fit smugly in such a box. The overall structures would gain a better stability. I certainly do not wish to deprive you of enjoying your twiddling of individual cubes. I could never live with that! Of course the cubes can be taken out, twiddle them differently, construct a different non-cubical design, etc. For example, for Landry Staircase you would need a maximum of 27 boxes. I think this design would be beautifully stabilized. We would manipulate with 27 boxes instead of 216 Rubik's cubes. It would be much better setting up this design for an exhibit. You would need to prepare the cubes beforehand, but you need to do that anyway. I met Dr. Ken Landry, professor of dentistry at Washington University in Seattle at one of the conferences I attended in the summer of 2000. 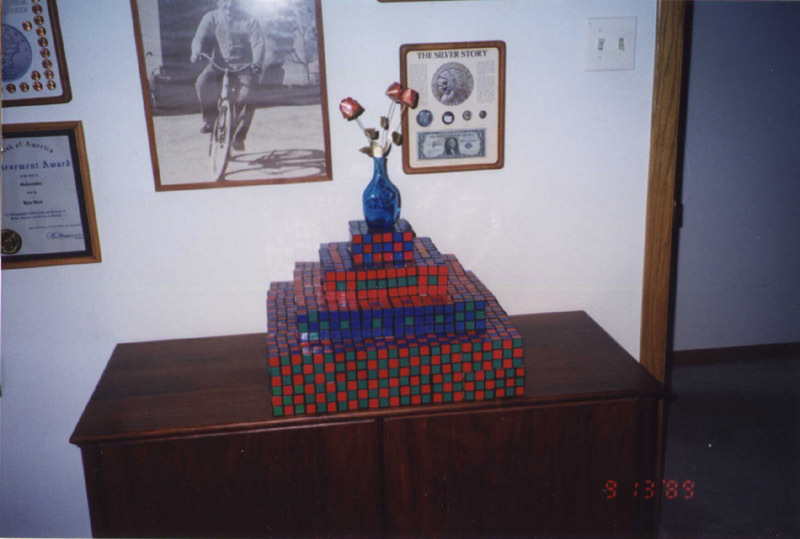 He too was exhibiting various structures, but no designs on Rubik's cubes. He had shown me one structure, in which I immediately recognized a possible shape for a non-cubical design. When I returned home, I constructed and photographed the design. It is my largest design so far, requiring 216 Rubik's cubes. People, who see it sometimes grab their heads and shout "Eeeeek!" However, the design is not that difficult. 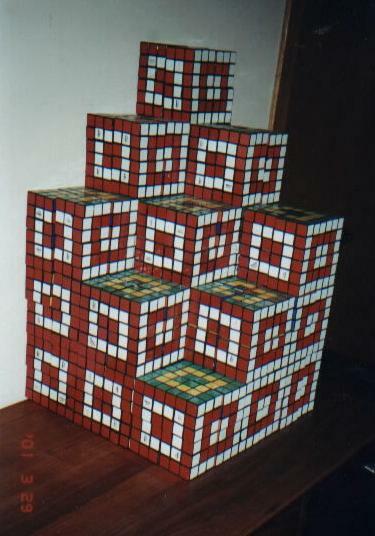 Just construct a 3x3x3 cube from, perhaps, cubical building blocks. Take a corner cube with its immediate neighboring edge cubes and place this configuration on the upper face. That's how the shape of the Landry staircase is created. The upper side of the original cube splits into nine sides. An eight-cube block replaces each cube of the shape. A block is; so to speak, a "mini-design" built from eight cubes in four parity pairs. If the shape has 27 cubes, and if each cube in the shape is replaced by an eight-cube block, then the overall design has 27x8=216 cubes. The Landry Staircase, as well as Lucie, are block designs. That's all there is to it. People also suggest I figure out some practical application for those designs. I am a very impractical and non-dexterous person. But a customer is king, whose suggestions must not be ignored. All I can d is try. So I placed small candles in cups in the middle of each of the nine upper faces. Some people said that it looks pretty. The design's "practical application" is that of a candleholder. I enclose two pictures if the Landry Staircase, with and without candles, so that you can see what's involved. Excuse me, but I am running out of original ideas. Finally let me point out that the Landry Staircase can have a shape of fewer or more blocks. A 2x2x2 shape has only eight cubes. Take one corner and put it in the upper face. This will produce four faces for four candles. And so on. 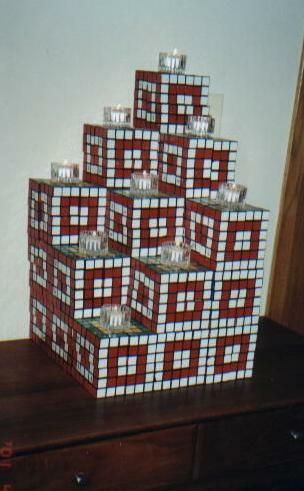 Of course, the more sides and candles you have, the more Rubik's cube you will tote to exhibits. For that reason I will probably stick with nine candles. There is another, even more compelling reason. I simply do not have 512 cubes necessary to set up a Landry Staircase having sixteen upper sides.